Local lad Gary Johnson was out with the top guys this weekend at the Chang International circuit, racing in the Thailand Kawasaki Superbike championship in only his third ever event. He recorded his best lap ever around the circuit with a time of 1min – 48.56 seconds taking around 4 seconds off his former personal best time. Starting from 16th on the grid he finished 13th against top opposition in the morning race. In the afternoon race the flying Scotsman really was flying due to brake failure and had to retire from the race, but look out for him this year in his first full season of racing. Our other local expat rider Canadian Colin Butler did not race today as his new Kawasaki bike has not been yet been delivered. 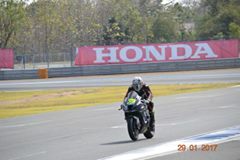 Report by the “Buriram Times” Motor Sport Racing Team Steve and Colin.